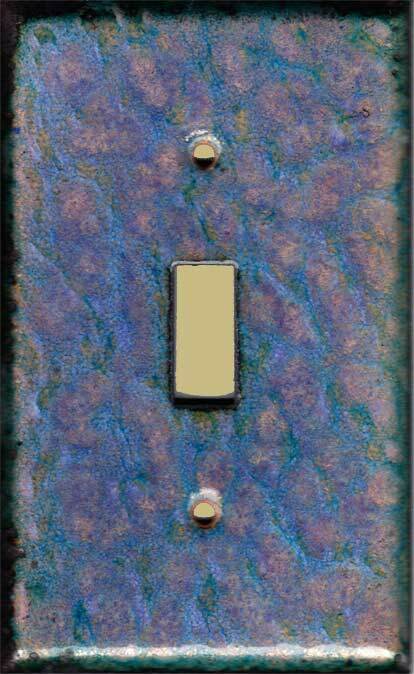 These original handmade enamel decorative switch plate covers represent styles, so that sizes up to triple toggle and triple decora or combination plates can be ordered. Including outlets covers and GFI's. 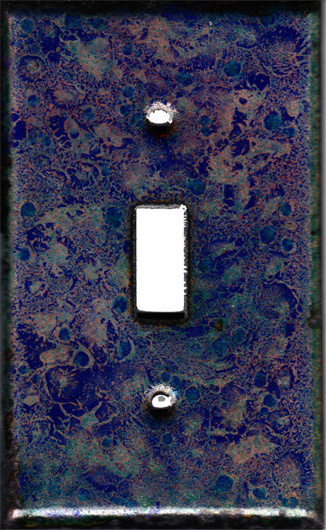 The story behind the artisan switch plates. 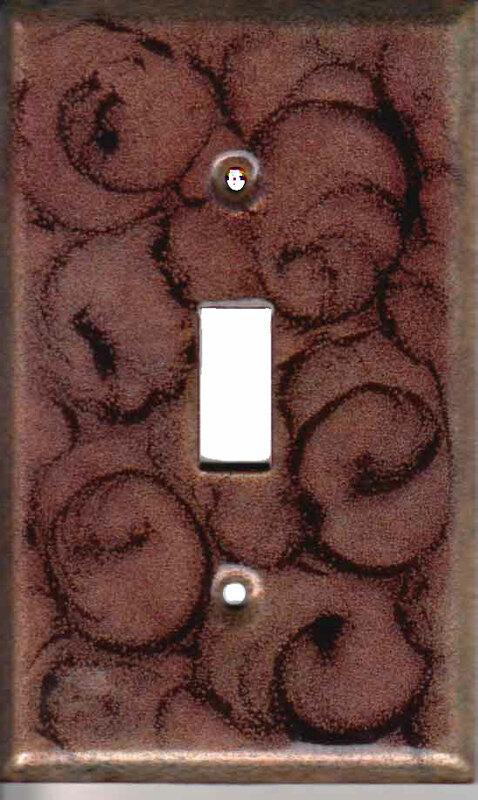 The first step before firing the switch plates (after sanding and cleaning it), is the base coat; this coat determines how the different colored enamels behave. If the base coat is an opaque enamel, then there are only one to two colors used besides the flux. The opaque layer is a much simpler base than the transparent base coat. Two of the above switch plates are started with an opaque base, they are the Mandarin on Cork switch plates, and the Cobalt Blue With Aqua on White Swirls switch plates. The rest of the switch plates shown above have transparent enamels as the base (generally three colors besides the flux), this gives the colors added later the glistening look of crystals. 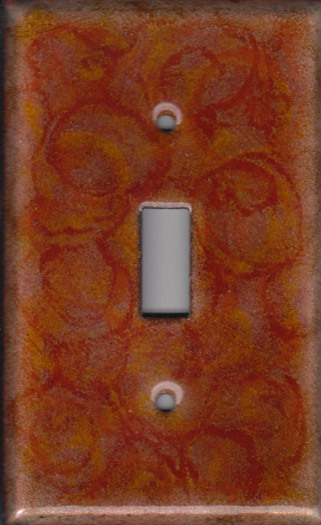 When the base coat is applied to any switch plate, counter enamel is also applied to the back of the switch plates to make it stronger and so that it doesn't warp on cooling after being fired. 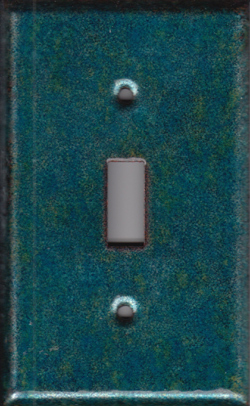 There are a few techniques that I use to create the designs and colors for the switch plates shown above. 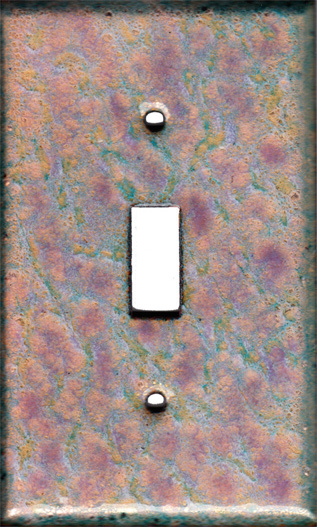 Each switch plate shown above will be described in the following paragraphs. 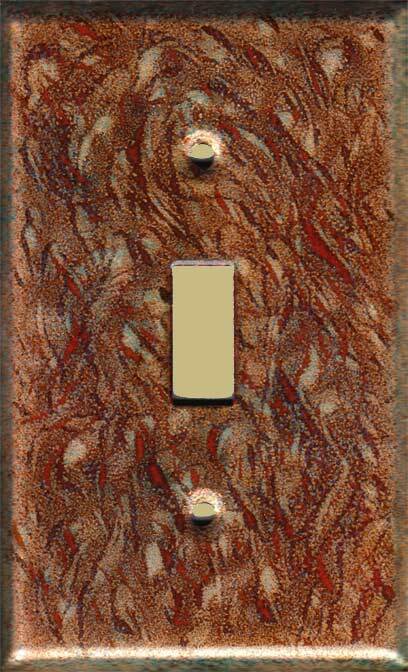 Dark and light red swirled decorative light plates: This switch plate has a thin black base coat. 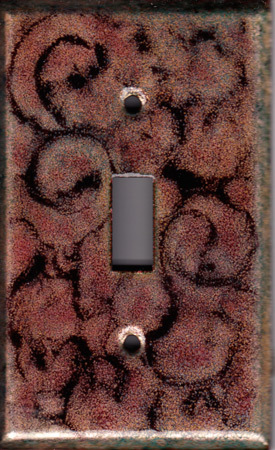 Next, a dark red enamel is sifted over the entire switch plate, then swirled with a brush. 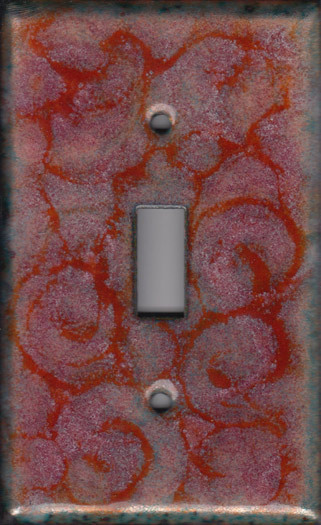 Next is fired, cooled, and more reds of different tones are added on the swirls and between, then another red enamel is applied over the whole switch plate. Black Swirl on Foil decorative light plates: This switch plate has a pale yellow foil base coat. 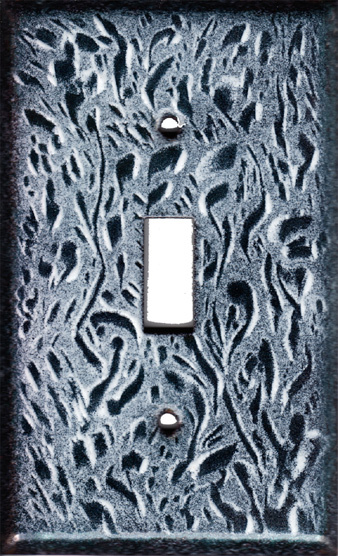 Next, a black enamel is sifted over the entire switch plate, then swirled with a brush. After swirling, I use a knife to move areas of the swirl to look like various figures. Then, more black is added to certain areas to create emphasis through darker and lighter tones. 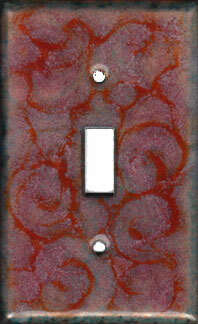 Deep Maroon swirls on Red tinted Foil decorative light plates: This switch plate has a pale yellow foil base coat. 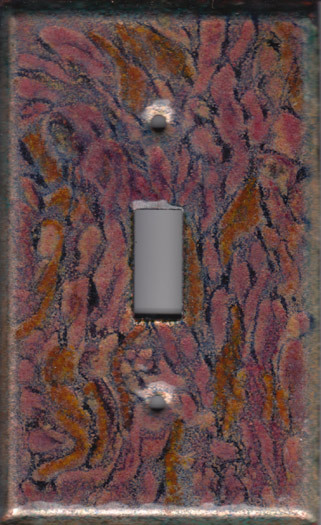 Next, a deep maroonish purple enamel is sifted over the entire switch plate, then swirled with a brush. More enamel is added to create emphasis through darker and lighter tones. 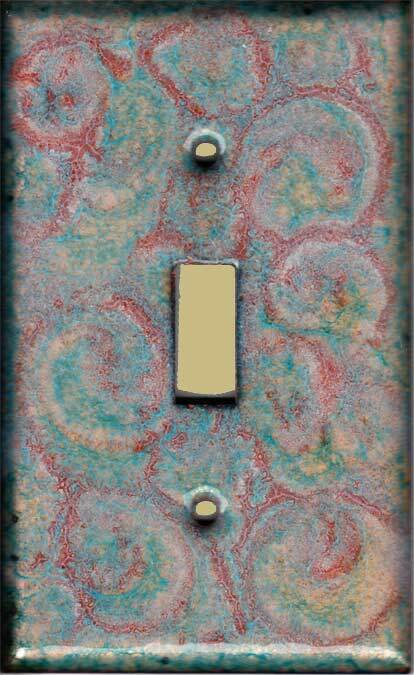 After firing this layer, another two colors are added to give the final look to the switch plate. 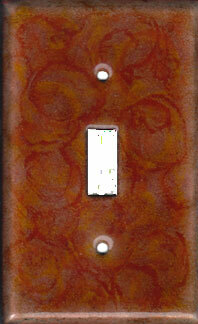 Mandarin Orange on Foil decorative light plates: This switch plate has a pale yellow foil base coat. 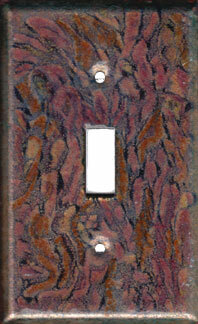 Next, a medium orange enamel is sifted over the entire switch plate, then swirled with a brush. More enamel is added to create emphasis through darker and lighter tones. 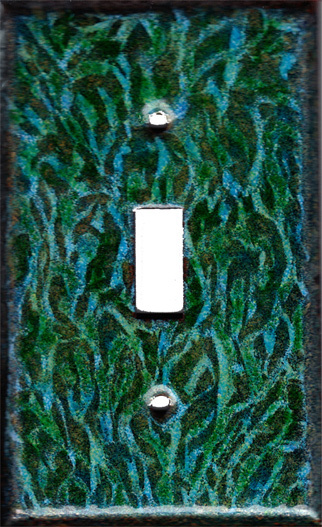 Sea Greens Striated decorative light plates: This switch plate has a thin black base coat. 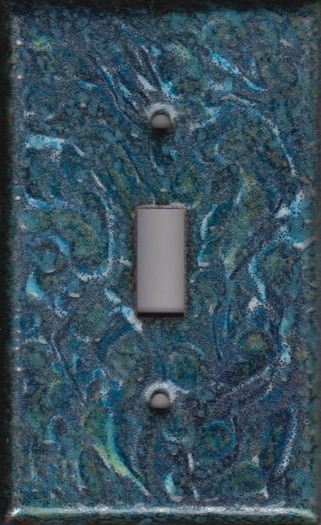 Next, a light opague enamel is sifted over the entire switch plate, then it is pushed around so that the base coat is revealed, leaving the opaque enamel for the striated colors. Next, four colors are added, usually with two or three of the other colors combined. 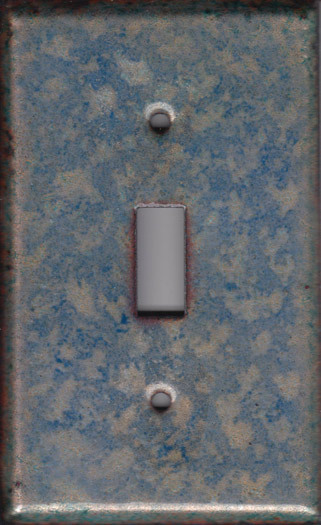 After firing the switch plate, the previous step is repeated with the addition of two colors sifted onto the entire switch plate. Brite Orange Swirl decorative light plates: This switch plate has a pale yellow base coat which gives a marbled look instead of crystaline. Next, a pale opaque color is sifted with a medium orange enamel sifted over it, then swirled with a brush. More enamel is added to create emphasis through darker and lighter tones. 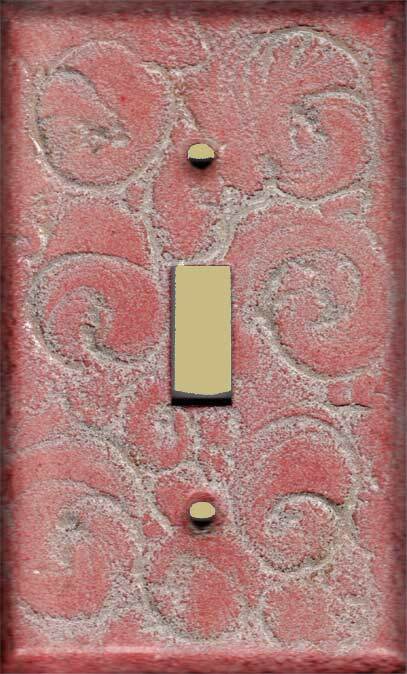 Pale Yellow Swirl decorative light plates: This switch plate has a thin opaque base coat which allows the pink color of the copper to show through (it is pink from the temperature it is fired at) . 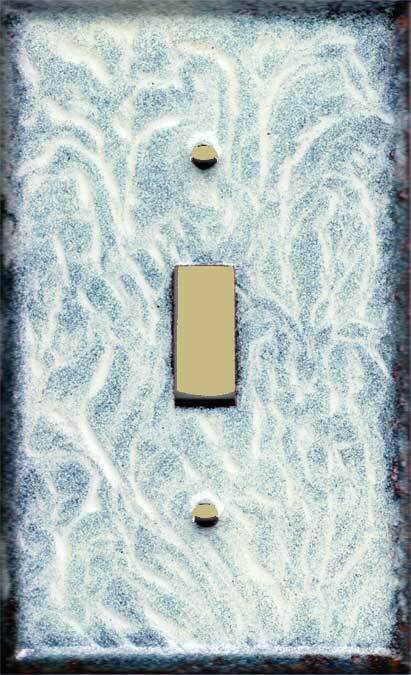 Next, a pale yellow enamel is sifted over an opaque grey enamel over the entire switch plate, then swirled with a brush. 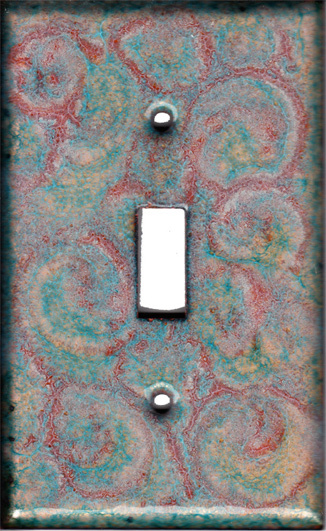 Orange and Copper Green Swirl decorative light plates: This switch plate has a pale yellow base coat which gives a marbled look instead of crystaline. Next, a pale opaque color is sifted with a medium orange enamel sifted over it, then swirled with a brush. More enamel is added to create emphasis through darker and lighter tones. 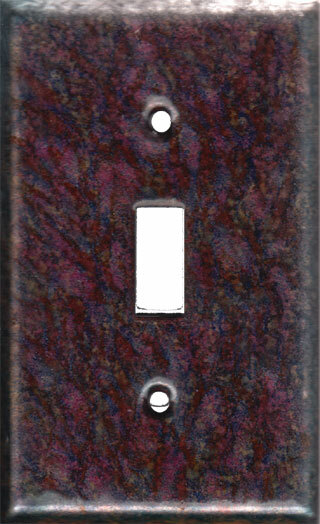 Cloudy Pinkish Purple with Blue decorative light plates: This switch plate has a pale yellow base coat which gives a marbled look instead of crystaline. Next an opaque blue is sifted on the entire switch plate a purple enamel is sprinkled on areas of the switch plate. Next the enamels are pushed around so that areas of the base coat are clear. 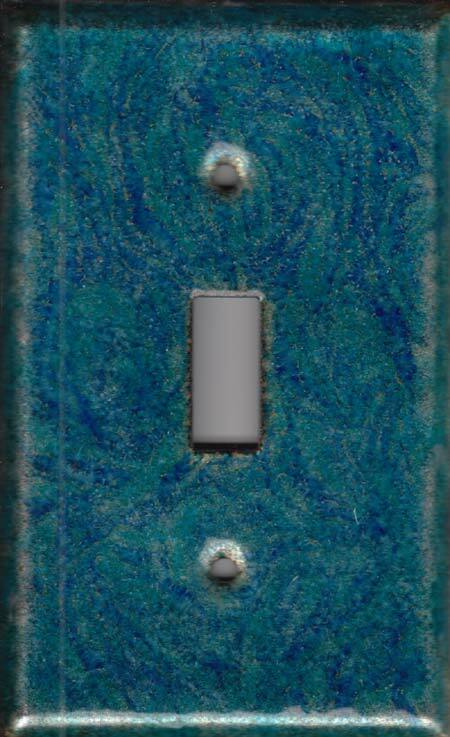 More colors are added and a blue enamel is sifted on before firing the switch plate. Pinkish Purple and Yellow with Blue-green decorative light plates: This switch plate has a pale yellow base coat which gives a marbled look instead of crystaline. 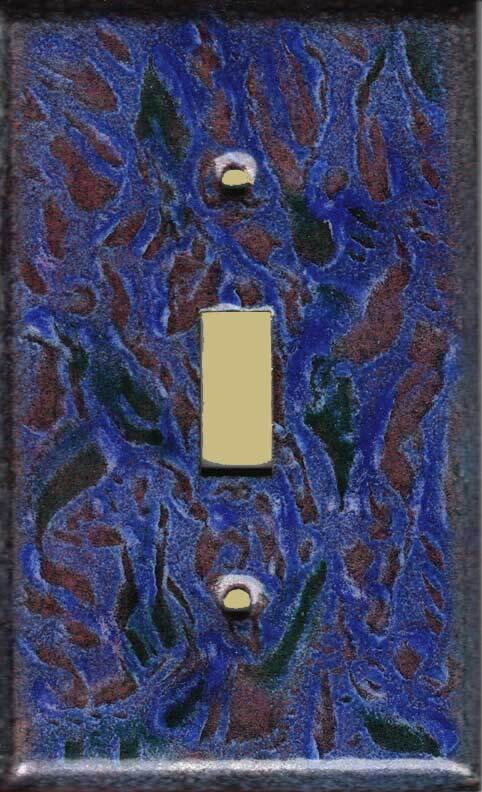 Next an opaque blue is sifted on the entire switch plate a purple enamel is sprinkled on areas of the switch plate. Next the enamels are pushed around so that areas of the base coat are clear. More colors are added before firing the switch plate. Blue Jay Slick on Yellow Foil decorative light plates: This switch plate has a pale yellow foil base coat. 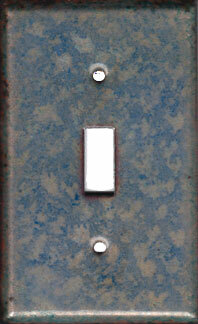 Next, a blue enamel is sifted over the entire switch plate, then it is pushed around to reveal some of the base coat. 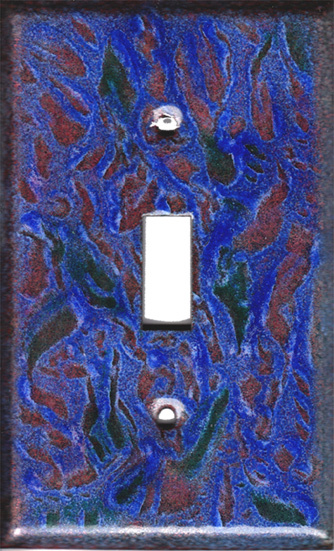 Cobalt Blue with Aqua Blue on White Swirls decorative light plates: This switch plate has a cobalt blue opaque base coat. 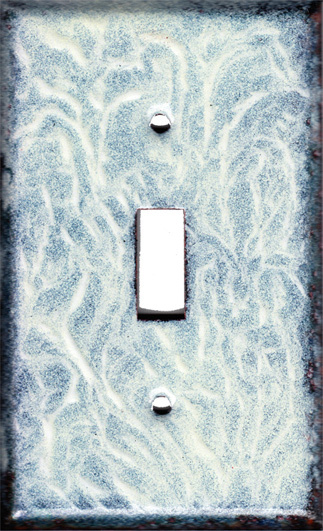 Next a white opaque enamel is sifted over the entire switch plate, then swirled with a brush. After firing, blue is added to the entire plate, with heavier blue over some of the white swirls. 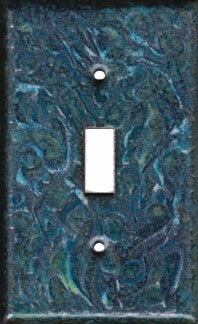 Dark Blue and Green decorative light plates: This switch plate has a pale yellow foil base coat. 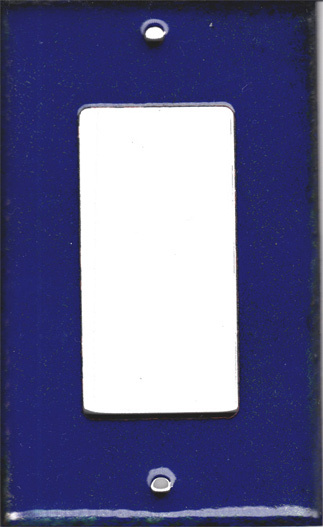 Next, a dark blue enamel is sifted over the entire switch plate, then it is pushed around before firing. 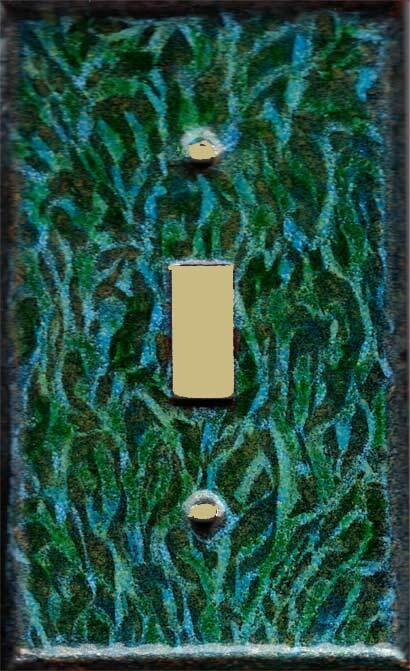 The final firing adds a green enamel over the entire switch plate. 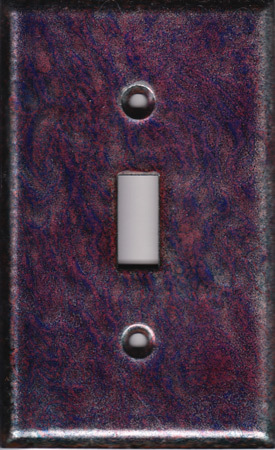 Purple and Red Striated decorative light plates: This switch plate has a pale black base coat. Next, a purple enamel is sifted over the entire switch plate, then it is pushed around before firing. The final firing adds dark red enamel on parts very thick and a red enamel over the entire switch plate.